Hello. 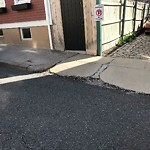 The sidewalk is crumbling and presents a hazard to pedestrians. 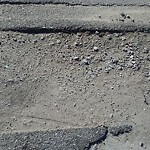 I'm having trouble driving over it to access my driveway. Is it possible to get it fixed? I've paid to patch it, and it never lasts. Thank you. 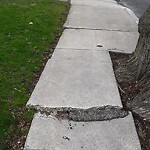 Sidewalk in need of repair. 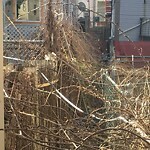 Tree roots continue to cause problem. 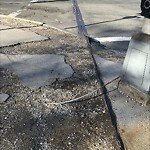 Exposed rebar on the south west corner of the intersection. Very very dangerous. 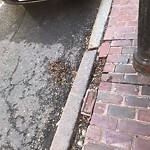 Cause of damage: Other | Additional info: There is a sidewalk grid that is missing that needs to get replaced. Huntington ave side of the sidewalk. 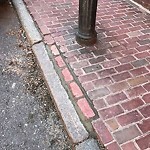 Bricks need to be replaced and there is black pain on the sidewalk and blue paint on the curb. Thank you for all the hard work you do! 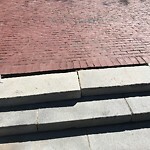 These two steps, leading up to the fountain in Rose Kennedy-Columbus Park, look kind of dangerous. Older people walk up and down them, children, strollers, etc. Hopefully they can be fixed soon. Thank you. The Handicap Plate at the crosswalk is missing. 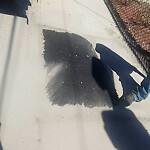 It is a tripping hazard ad well as an eyesore on my sidewalk.When it rains it creates a muddy mess.I've reported this twice in two years.